Thello offers you a simple, flexible price offer with two main price categories. The Smart fare and its non-exchangeable and non-refundable low prices are available up to 7 days before departure. Thus, you can travel from Paris to Venice or Milan from € 29 in the 6 couchette compartment and from € 85 in cabin 2 beds. For flexibility, Flexi fare can be modified* once for free and refundable with a hold of 10 euros until 24 hours before departure.  Smart and Flexi fares vary according to the demand and the filling of trains. With a gradual increase of prices – for example for the Smart fare from € 29 to € 59 in the 6 couchette compartment – you have multiple low price opportunities, especially during off-peak periods and for early bookings. Don’t forget that when traveling at night you save one night’s accommodation.  Children under 4 years old (up to the day before their fourth birthday) travel free of charge, and do not require a ticket provided they share the bed or the couchette of an adult accompanying them in the limit of one child under 4 years old per adult. Children from 4 to 14 years receive a 30% discount on the adult price at Smart and Flexi rates. Thus, the youngest can travel from Paris to Venice from 20,30 € in 6 couchette compartment. Thello and Trenitalia connect Paris and Dijon to all cities in Italy. Indeed, you can take advantage, under conditions, of the offer “Thello Promo”, a special rate on the Thello night train associated with an exceptional discount on the main line “Frecce” Trenitalia, to continue your journey in Italy beyond the cities served by the Thello night train. To travel more peacefully, we offer to all mobility impaired passengers the possibility to be accompanied, the companion is getting a dedicated rate, the rate Disabled Companion. Holders of a Eurail or Interrail Pass valid for France and / or Italy can get a Special fare on Thello trains. We strongly recommend our passengers to hold a ticket before boarding. However, if you have not been able to buy your ticket before departure, it is still possible to do it on board (subject to availability of seats). Introduce yourself, as soon as you board, to the train crew to regularize your situation. A dedicated rate will be applied. The full list of the prices applied on board is available here. Tickets sold on board are neither exchangeable nor refundable. Be careful, if you do not spontaneously introduce yourself to the crew, you will be considered in an irregular situation and be fined. To find out prices for a particular trip, search using the sales engine available below. See all the pricing conditions in the table below and the Thello general conditions of sales and transport here. Customers’ attention is drawn to the fact that in application of the French Consumers code, the right of retraction does not apply to contracts the purpose of which is the sale of train tickets. Please wait while we check prices and availability. Caution, your purchase on the Thello website can’t be processed because the browser version is outdated. Please update your browser. This train is not running between Marseille and Nice. This train is not running between Nice and Marseille. Due to works on the railway networks, these trains are temporarily closed for sale. This train will end at Dijon. These trains are temporarily closed for sale. Today March 24, the train won't stop in Moncao - Monte-Carlo.